Nothing could get me more excited about a musical adaptation of one of my favourite movies of all time. A catalogue of hits from one of the greatest vocalists of all time (RIP Whitney), a lead role taken by R&B superstar vocalist Beverley Knight, and a prime spot on London’s West End. What could go wrong? A lot it seems. 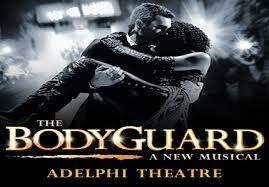 Despite having a great plot and soundtrack to use from the 1992 ‘Bodyguard’ movie, the musical adaptation has been tweaked to feature a love triangle between Knight’s character, pop-star Rachel Marron (originally played by Whitney Houston) , her bodyguard played by the utterly charmless Tristan Gemmel (no Kevin Costner) and her sister Nicki (played by newcomer Maria Okinawa, who does a decent job). This addition to the plot is largely unsuccessful and unnecessary, and seems to be added purely so they can include some of Houston’s other successful ballads that weren’t in the film, namely ‘One moment in time’ and ‘Saving All My Love for You’. Coupled with the disappointing plot-line is the lack of scenery and very cheap costuming. It’s difficult to see where the five million pounds of production costs in creating the show went to. The costuming itself was a major concern for me; Marron is supposed to be the biggest superstar on the planet, yet performs live on stage in JEANS! not at all realistic or evocative of the glamour you expect from the West End. The production seems to totally lack in everything except vocally, in which Knight is the standout performer. If you’re a fan of the singer, or even of the late Houston, it’s definitely worth a trip just to see her belt her way through the show with powerhouse performances. The vocalist manages to make each song her own, despite their familiarity with me and the wider audience. Her rendition of ‘I will always Love You’ brought goosebumps to the skin and commanded utter silence in the crowd; even the hen parties in the back who thought this show would be worth a drunken pit-stop. It’s not all doom and gloom and balladry though, the show does kick off full of energy with an unfortunately misplaced performance of ‘Queen of the night’. The last ten minutes are the closest this show gets to replicating some of the West End’s classic theatre productions, by including Houston’s more up-tempo numbers, like the Global hit ‘I Wanna Dance with Somebody’. All the greatest fears of what could go wrong by turning cinema into theatre have happened with this project. With a ‘half-gig, half thriller’ vibe, tacky and unrealistic adaptations, and a serious lack of character and story development, has left this a very thin production indeed. The show has been running now for little over a year, and I’d be astounded if it manages to run for much longer after Knight leaves her role in May this year.